Sporting a mid blue hull and broken white interior the Collars Skiff looked the very much the part at the Southampton Boat Show in September when she was shown for the first time on our sister company, Satlerns Boats Ltd, stand. A collaboration between the two companies has resulted in a stable yet fast 16' traditionally styled skiff powered by the finest wooden spoon oars to give the complete package for the discerning rower who is used to rowing but needs a craft that can perform equally well on flat water as it will in rougher conditions. With stainless steel outriggers increasing the beam to 1.4meters, sliding seat arrangement, and 9' spoon oars, the feeling when rowing is more of a single shell sculling boat than skiff, ideal for fitness or simply enjoyment. With many options each skiff can be tailored to suit the individual whilst keeping the look and feel of the traditional art of rowing. 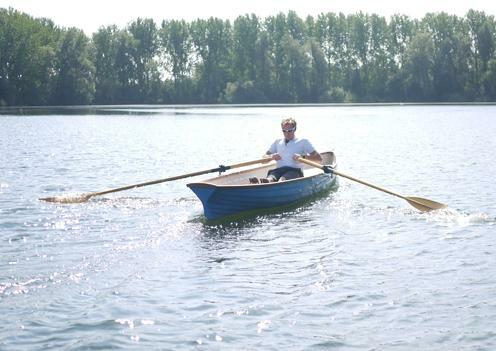 The Collars Skiff is available to try at our works in Oxfordshire on our private lake, so please phone to make an appointment and rediscover the enjoyment in simple rowing.